Click the 'Processes' stripe to view all running provesses. 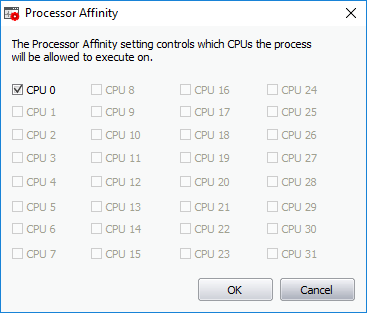 Set Affinity - View and modify the processor affinity (the CPU to which the process is assigned) in a symmetric multiprocessing operating system. In a symmetric multiprocessing operating system, each task (process or thread) is assigned a tag which indicates its preferred processor. This processor is assigned to the task at run time. Some remnants of a process may remain in one processor's cache from the last execution. Scheduling the same process to run on the same processor next time will increase the efficiency of the process, when compared to running on another processor. For example, an application which does not use multiple threads, such as some graphics-rendering software. is run on multiple instances. Allocating it to the same processor will reduce the performance-degradation due to cache misses and increase overall system efficiency. 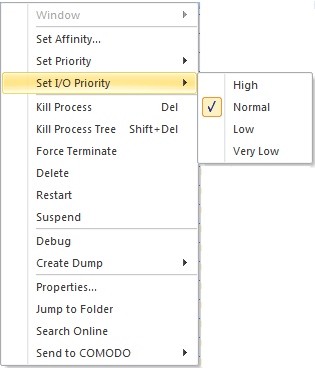 Note: This option is not available when multiple processes are selected. 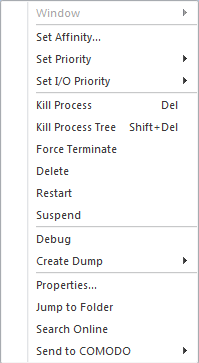 Kill Process - Terminates the selected processes. KillSwitch can, except under extraordinary circumstances, terminate any process. This includes processes which are protected by rootkits or security software. Kill Process Tree - Terminates the selected process and its descendants (child processes). Force Terminate - Stops the selected process(es) forcibly. This option suits for closing any programs that are under 'Not Responding' status. Delete - Deletes the selected (running or suspended) process(es) from the disk. KillSwitch can delete any process, including ones protected by rootkits or security software. You will be asked for confirmation before deleting a process. Your computer will need a restart for this action to take effect. Warning: Deleting a process will permanently remove the application that has triggered the process. Restart	- Reboots the selected process with the same command line arguments and working directory. Debug	- Starts bug fixing for the selected process. This is useful for software developers and testers to find issues in applications. Create Minidump... - Creates a small dump file containing only essential data. Create Fulldump... - Creates a dump containing all available data. 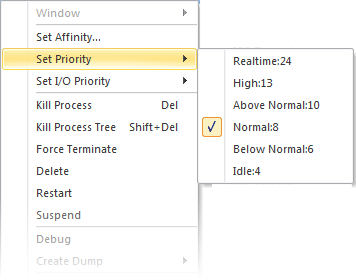 Properties - Opens the properties dialog of the selected processes. See View the Properties of a Process for more details. Jump to Folder - Opens the folder containing the file in Windows Explorer. Search Online - Opens the default web browser of your system with the search engine specified and searches for information on the process on the web. Send to COMODO - Submits the application that has triggered the process for analysis to Comodo, as False Positive (if identified as suspicious by KillSwitch) or as Suspicious file as selected from the sub-menu. You can submit the files which you suspect to be a malware. The files will be analyzed by experts and added to global white list or black list accordingly in order to benefit all the users of Comodo security products world wide.